Tag your favorite items and places with a sticker from iFixit. Show the world that you believe in the power of repair with this iFixit-exclusive Fix the World sticker. Leave your mark on your favorite computer! Or on something else. Show your fixer's pride with the iFixit lapel pin! Messenger bag from our Repair Business Toolkit. 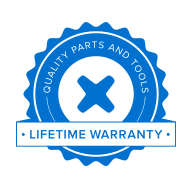 Represent your favorite online repair community by wearing our Standard Issue Tee. The first t-shirt emblazoned with our new look.